The SPC3 kits are Sold Out! 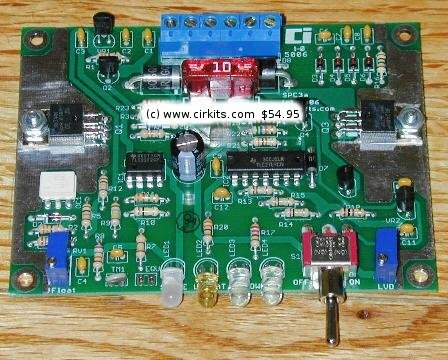 CirKits.com is offering a discounted SCC3 and LVD1 kit bundle which provides similar functionality as the SPC3, but with more features and support for higher current levels. 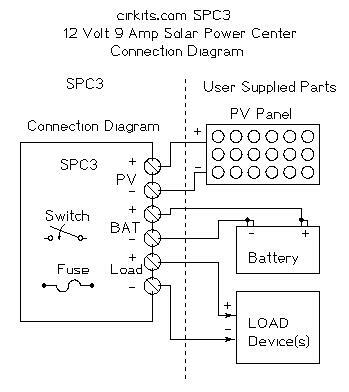 The SPC3 kit contains all of the circuitry for a medium-sized solar power system. It includes a solar charge controller for battery charge regulation, a smart on/off power switch with automatic low voltage disconnect operation and a built-in white LED lighting system. Additional lights and other 12V devices can be connected to the load terminals and controlled by the SPC3. The SPC3 can regulate up to 9 amps of incoming solar power and can switch an external load of up to 10 amps. The SPC3 can be used as a stand-alone solar powered lighting system controller for a one room building or RV/camper. The SPC3 can also be used to power other 12V loads such as radios, communication equipment, small TVs, recording equipment, fans, cameras and more. The SPC3 can be installed in both stationary and mobile environments. The SPC3 should not be used for powering devices with high surge currents such as large motors or high powered car stereos. The SPC3 charge controller section includes: a battery float voltage adjustment, a red/green Charge/Float state indicator LED and battery equalize terminals for occasional overcharging. A temperature sensor is included so that solar battery charging is temperature compensated. The SPC3 load controller section includes: a momentary action on/off switch for turning the load on and off, two bright white LEDs for a built-in light source, a low battery indicator LED that warns of impending shutoff and a low voltage disconnect circuit that disconnects the load when the battery discharges below a specified voltage. See the SPC3 specifications for more detailed information on the circuit. The SPC3 Photo Gallery shows some real-world uses of the SPC3. Combine the SPC3 with a solar panel, rechargeable battery and external lights or other load devices for a reliable source of DC power that's available, even when the power company is not. The SPC3 kit makes a great student project, it can be used as the foundation for many science and electronics projects. Batteries, solar panels, load devices and solder are not included with this kit. Follow the Alternative Energy Web Sites link below for solar panel and battery suppliers. The SPC3 kits are sold out, the SCC3 and LVD1 kit bundle can be used instead.